And yeah, the toggle switch jumper wire thing is the thought behind my fused link solution...I just don't want to have to mount a switch somewhere. So I was thinking of using a fuse that way. Certainly not as flexible, though. Hmm...I have a GT1, so I think I have a couple of blank buttons over by the gas door button? Perhaps something could go there. 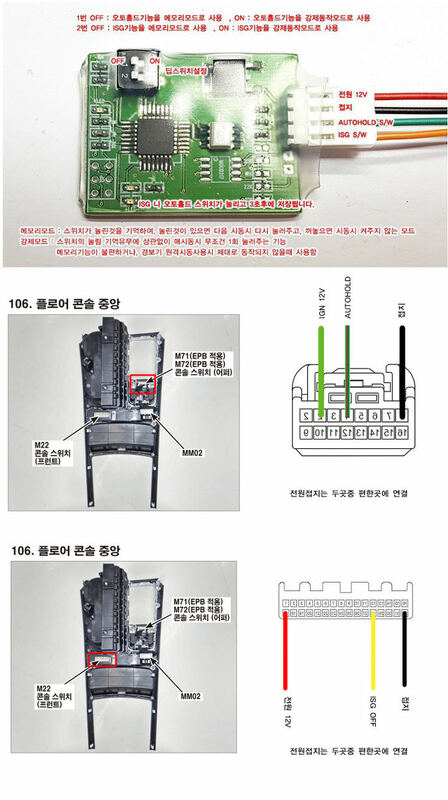 Also, I found from another forum, some images of a stinger memory module that supposedly retains ISG, auto hold, as possibly seat warmer states in memory? Site is in Korean, and it doesn't really look like it's an order page, but somebody mentioned something about $50. That's a little much for me, I think, but it does give pinouts for the switches! So that's helpful for jumper testing. Maybe someone will reach out and order a batch of these things or something? Lots of people seem interested. As for me... At $50, I think I'll stick to my replace a button with a latching button idea. @DesignDawg based on example 106 at the very bottom. Would adding a jumper from Pin 17 to Pin 28 work? I'd be very very hesitant to say yes to this, because, having not pulled the thing out and looked at anything yet, I don't think that these wires are going to be directly connected to any kind of switching. There's likely going to be a circuit board with resistors and such, and we don't really know what the other pins in this connector are. The smartest thing to do here is to look at the board itself and figure out exactly what that switches doing in relation to these pins. You don't want to be feeding 12 volts into any piin to test on a low voltage circuit like this. Transistors and other types of components can be very very sensitive. What's safe about keeping the button held down is that the button being pushed is already a known safe state for this circuit. And one of the first things u did when I tested this was to see if there was any heat being generated at all by holding the button down. I haven't perceived any. If 12v was directly involved in the switching of this, there would also likely be a high value resistor involved, and you'd almost definitely feel that. And your button might melt. In short: let's not test that, no.